Last night I went to the Danubio Azul restaurant. I love Chinese food and this place is self-promoted as "the best chinese restaurant in town". I think it's true. The place is big, well decorated, service is good and the food (the most important part) is great and very varied. 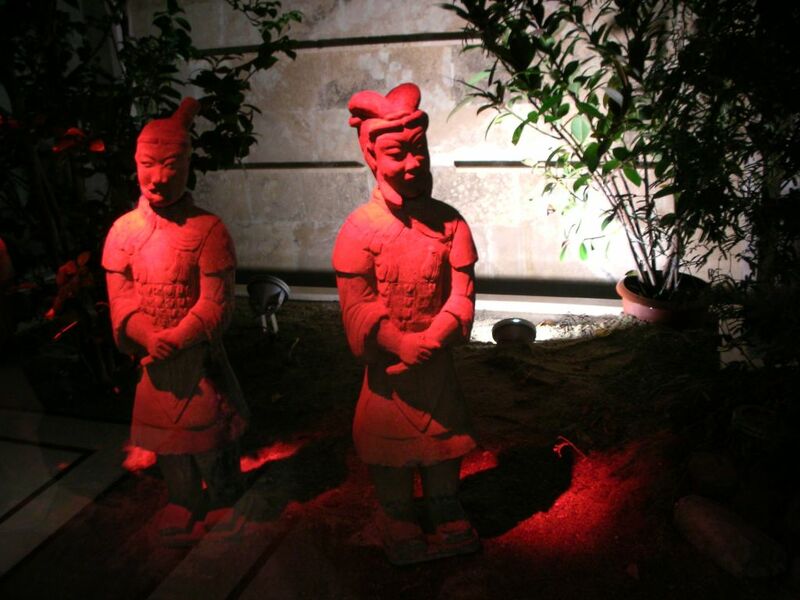 These chinese warriors are part of the décor, in an internal patio. If you come to Santiago, this restaurant is a must. I guess I wouldn't think of going to a chinese restaurant if I was visiting Santiago, but why not? I love Chinese food and would love to dine there sometime. Neat shot! Love Chinese food too...I'm really curious how it compares there in Chile! Fine post, I love Chinese food too, is for a good occasion. Saludos. La couleur de ces deux guerriers est speciale. On a un superbe restaurant chinois aussi à Evry, un vrai plaisir. The color of these two warriors is special. There are superb restoring Chinese also in Evry, a true pleasure. Sounds good to me. And the little sculptures are lovely. Lovely! Oh, Lovely! I love bit Chinese restaurants - there's something special in the atmosphere. Very nice, I'm definitely going to check this place out. I am starting to shake due to Chinese food withdrawal, but I couldn't bring myself to eat at the place near me that didn't have a single Chinese person working there. I´ve been in that restaurant, great environment, awesome food and definitely the best Chinese restaurant in town. Love going to Chinese restaurants, like PF Changs or China Grill, nothing to envy in Santiago. Also, has a great location and safe a block away from ritz, place I stay when going to work to santiago..